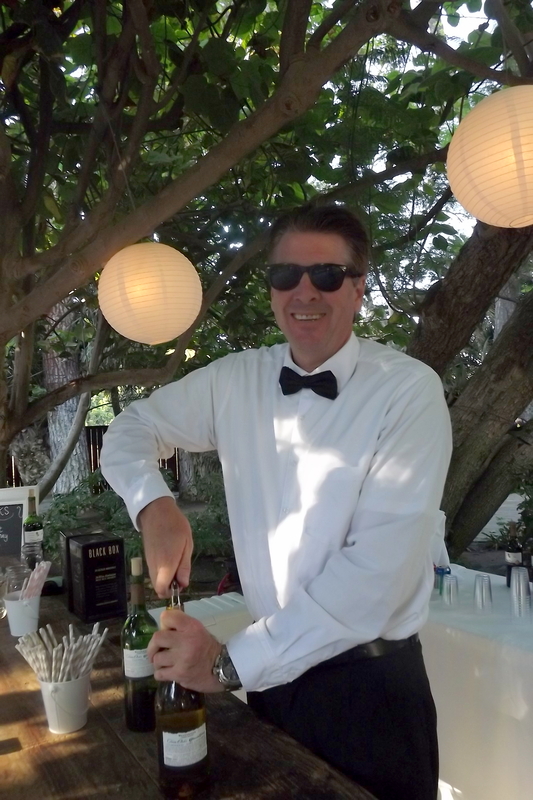 Last night, Shaken Not Stirred provided bartending service for a wedding at the McCormick Home Ranch in Camarillo. 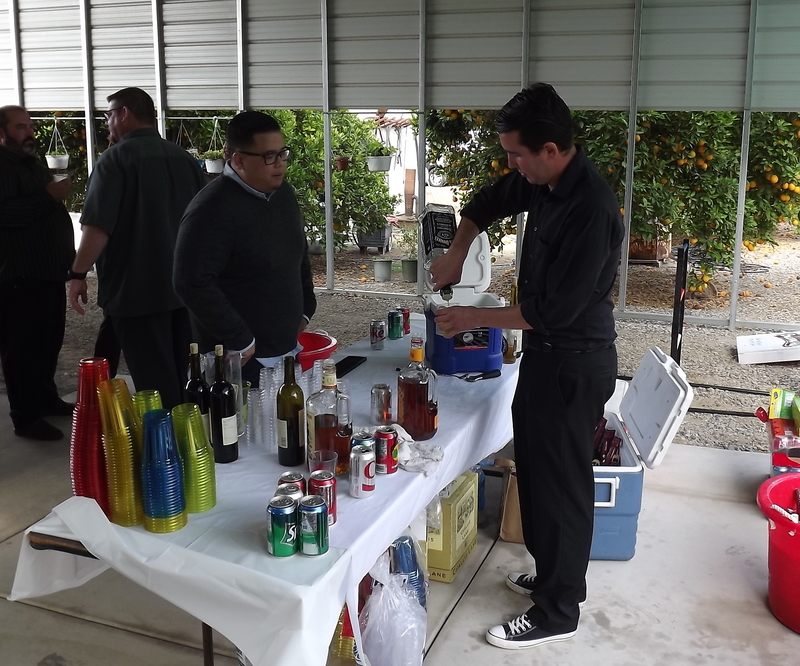 I brought along another bartender to serve wine and beer to around 150 guests at this very nice venue. 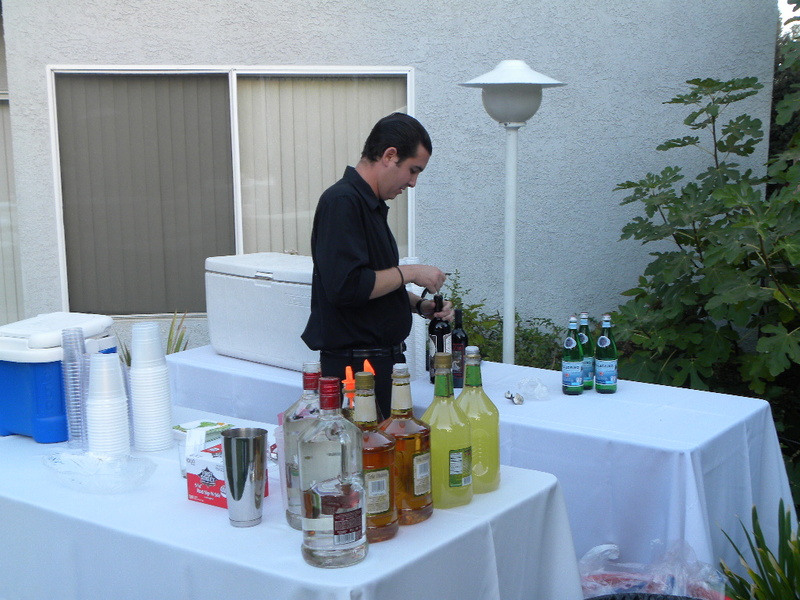 I hope to bartend many more events at this location in Ventura County. 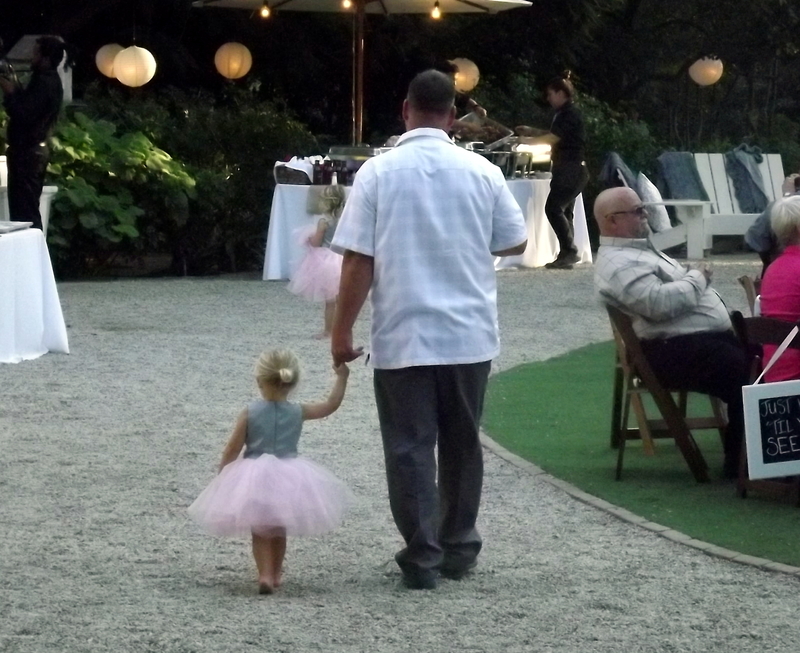 The weather was perfect for a wedding and a nice ocean breeze blowing in from the coast provided natural air conditioning. Forever Young Brewery, provided some kegs and he had a keg cooler with Co2 bottles, which makes it very easy for the bartenders. This is really the best way to serve beer from kegs – and I dread the pump up taps that slow service way down and the beer is often way too foamy. We had six different beers to serve, from a light ale, an IPA, two different porters, a stout, and Coors Light. We served completely out of the Ale and IPA, but there was plenty of the other beers left over. 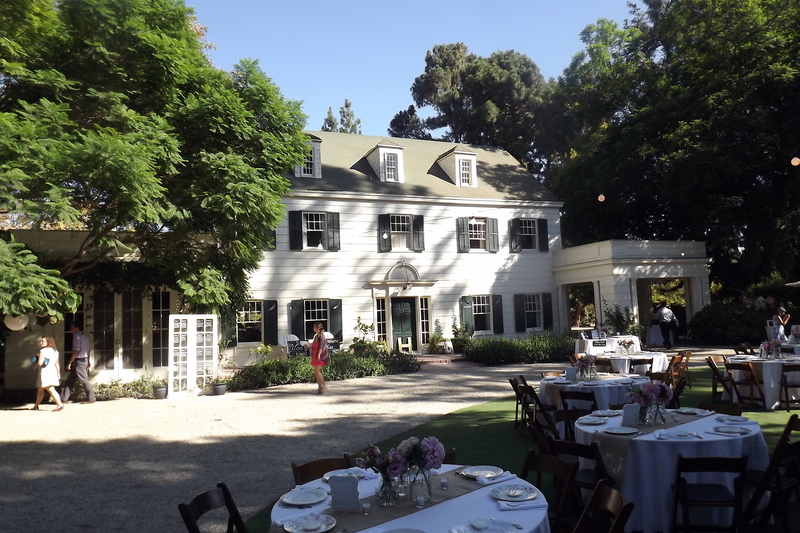 We also served Chardonnay, a Moscato, Merlot, and Cabernet. We ran out of white wine, which is always the biggest seller at weddings. After the initial rush directly after the wedding ceremony, I probably could have handled this party by myself, but I usually recommend that people book two bartenders for parties over one hundred people. I have several great people who work with me, and the service is much quicker, especially when a big line to the bar forms. 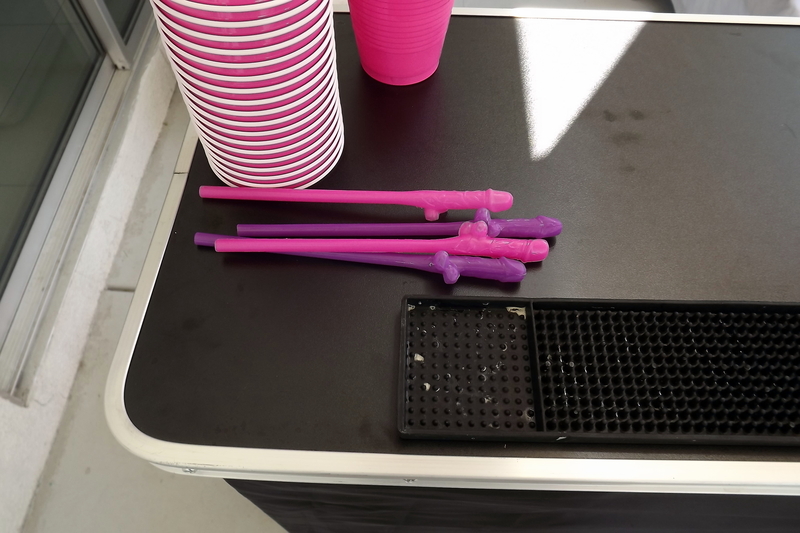 We usually try to pick up empty glasses and keep the tables and area clean when we aren’t busy. 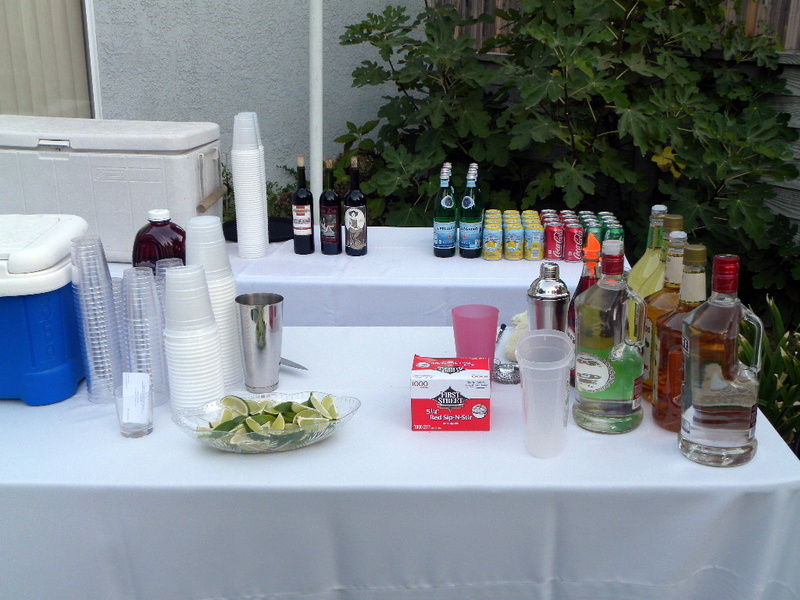 Good bartending service is about providing all around service, not just serving drinks. 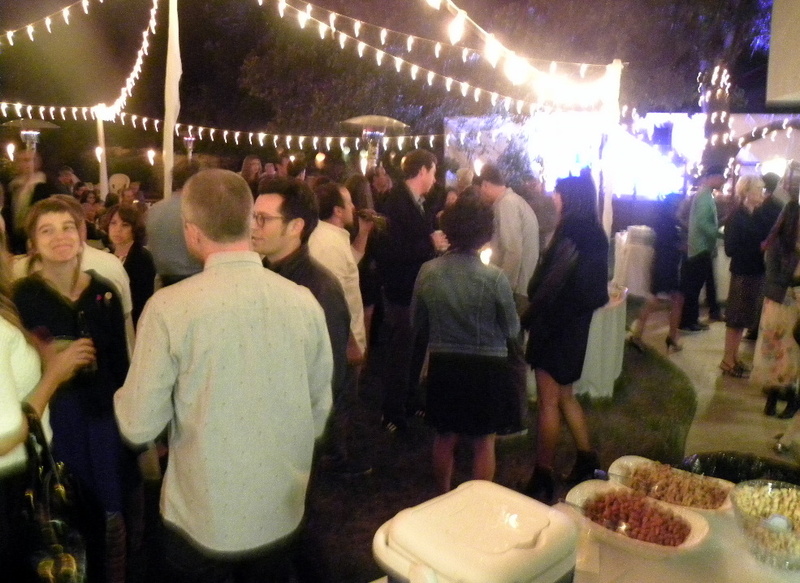 provided the catering and their food is always excellent. My son has worked for them for years and they are a very good company that is growing in Ventura, Los Angeles, and Orange counties. 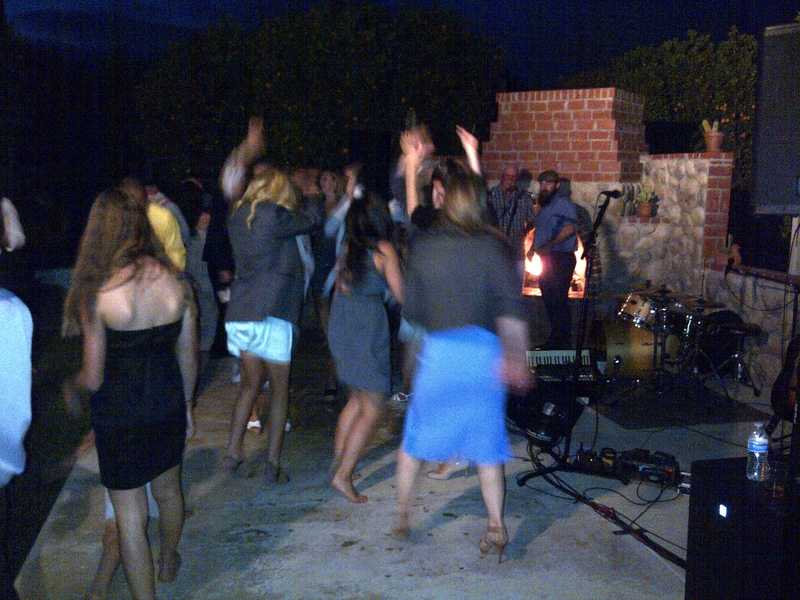 Tonight I have another wedding in El Monte, and then tomorrow am doing a backyard pre Labor Day party in Redondo Beach. 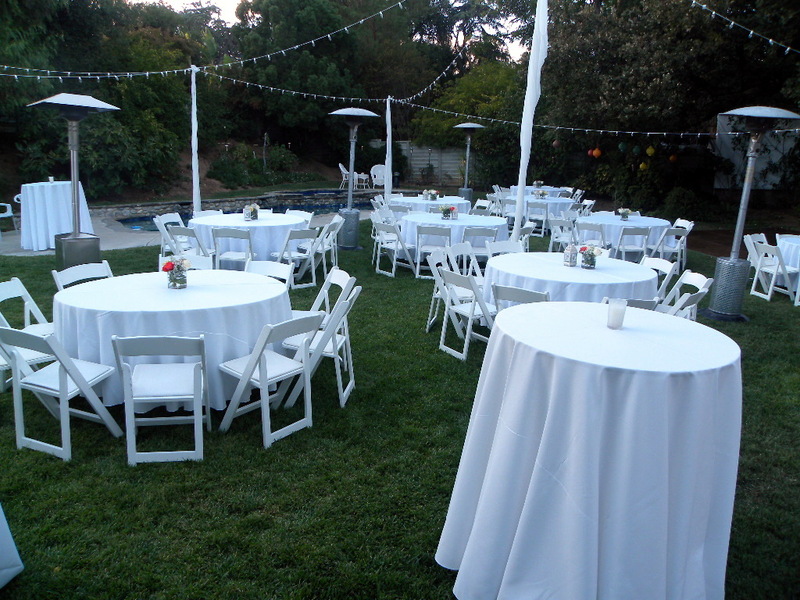 This marks the official end of the summer, but not the wedding season, as I still have several wedding coming up in Westlake Village, Temecula, Palm Springs, and I just booked one in Santa Ynez. 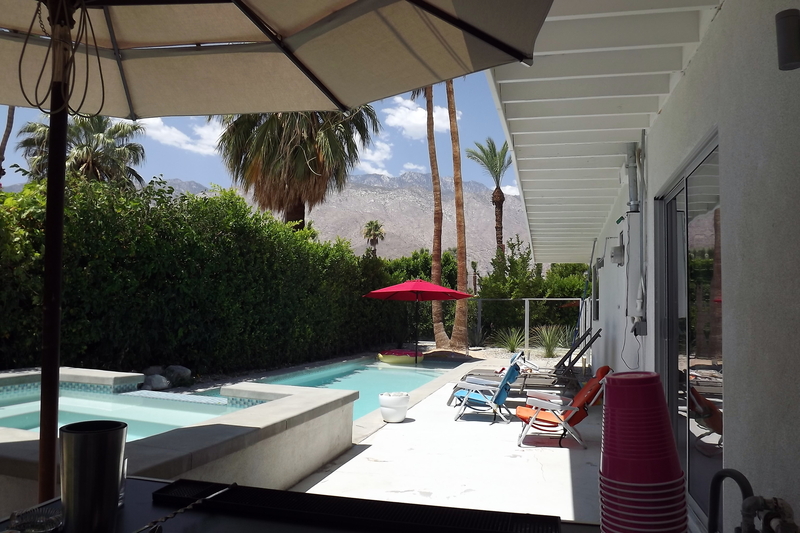 I am flying to Montana on Monday for a week long vacation, and then am providing bartending service for a cocktail party on my first day back in Beverly Hills. 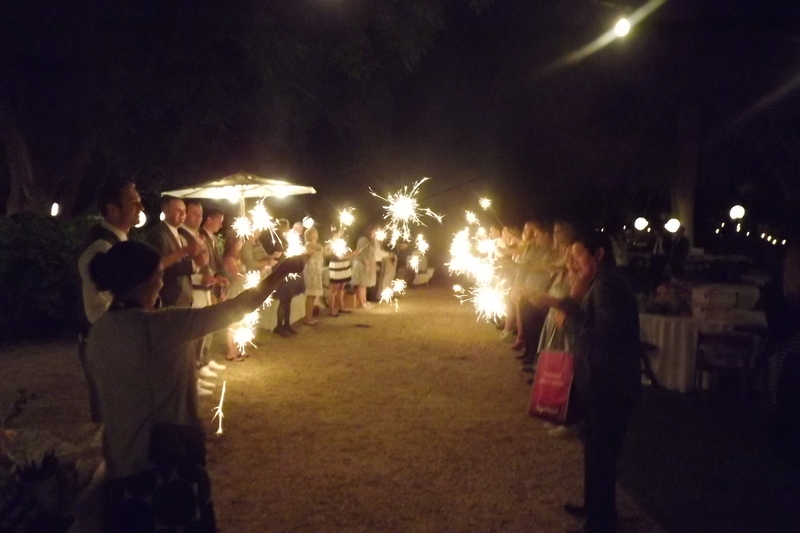 Friday night in Newberry Park in Ventura County was the scene of a man’s 50th birthday celebration and luau in honor of the occasion. 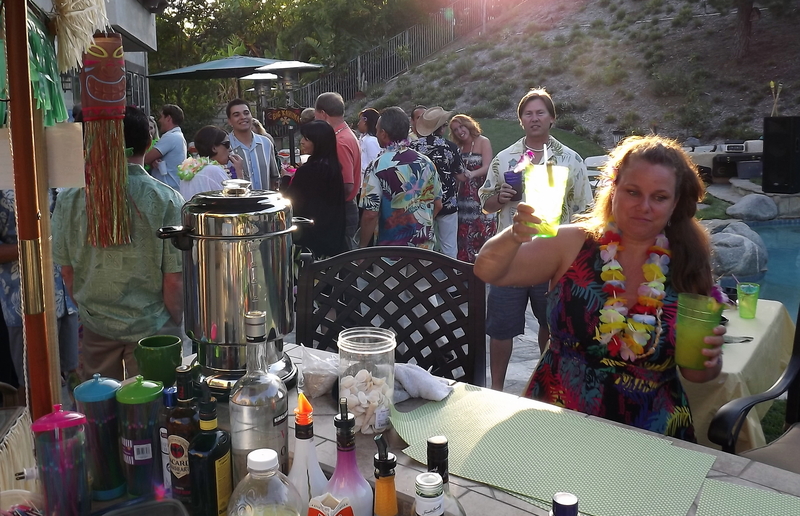 The party was organized as a traditional luau and they roasted a pig, handed out leis, played Hawaiian music and I as the bartender served Mai Tai’s and Blue Hawaiian’s. Everyone was dressed for the occasion, including me. There are several recipes for Mai Tais. The recipe I used is what most bars use, and I think tastes the best. It is a pretty sweet drink, and deadly if you don’t watch out. The way I was making them last night creates a layered look – Bacardi White Rum, orange juice, pineapple juice, a dash of grenadine, and a Myer’s Rum floater. It seemed to be a hit, because we went through two 1.75 liter bottles of rum very quickly. The Blue Hawaiian was the second most popular drink, and I made Bay Breezes for the vodka drinkers. I helped the host make a shopping list and was getting a little nervous as we started running out of things, but as it turned out we ran out of them just in time, because we were almost completely out of booze by the end of the party. 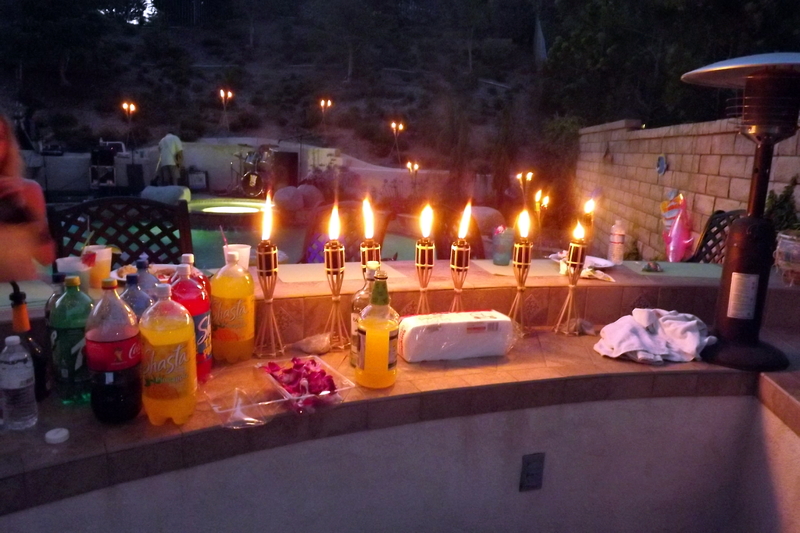 We also served Long Board beer, Pinot Grigio, and Chardonnay. In the future, I think I will add more booze to shopping lists. The host seemed to be happy there was not much left over, but it would have not been good if we ran completely out of everything with an hour to go – which we would have if people had not slowed way down on their drinking. Every party is different that way. Salute to the Mai Tai! out of Orange County provided live entertainment. They are a very good cover band and did several Eagles songs very well, and many other classics. There was a whole segment of the party where the host’s friends and family members got up and talked about him and it was a very nice tribute for his 50th birthday. The man must have done a few things right in a half a century judging by heartfelt tributes from his best friends, coworkers, and family members. Certainly it must have been a memorable occasion in the host’s life. Tonight, June 14th, is the first Saturday night in some time I have not had an event to do. I guess it wasn’t meant to be. I have a graduation party in Orange County tomorrow and I guess the powers that be decided I was getting greedy trying to do three events in one weekend. 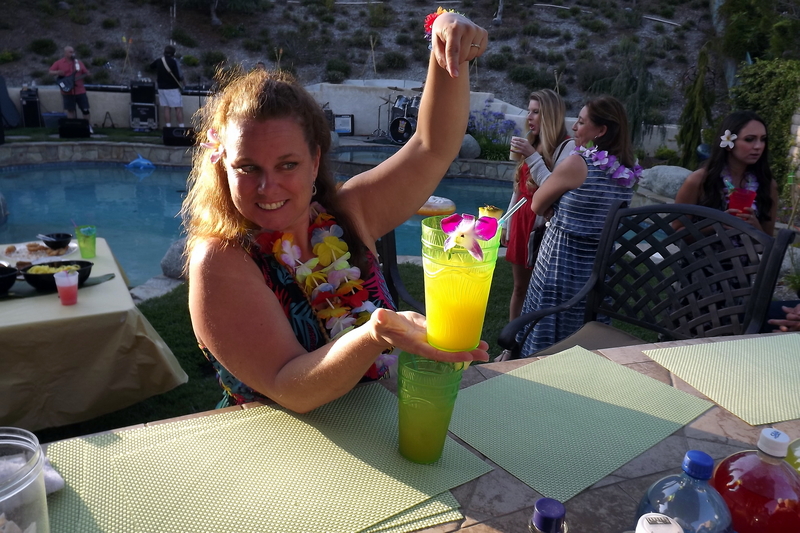 Never the less, if you are reading this right now and need a mobile bartender last minute in Southern California – call me!